What is Near Field Communication (NFC tags and NFC cards)? 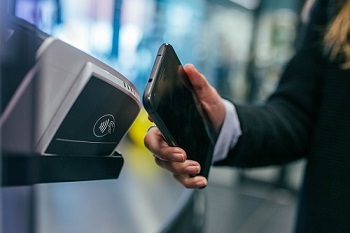 Near field communication (NFC) is common these days and has gained popularity among businesses for its versatility. You have probably seen NFC tags in clever advertisements in bus stops or shops and even some business cards. NFC tags and NFC cards can store wide range of information on them such as lines of text and website addresses. NFC tags are passive and do not need a power supply therefore you can hold the information on them for a long period of time and once they come in contact with an NFC reader, the information stored on them are transferred to the reader. A reader is not a specific device, it could be a cheap mobile phone which is NFC compatible, as most of the new mobile devices and tablets are NFC enabled. How businesses use NFC tags and NFC cards? NFC tags are used for various reasons and there are virtually no limits, from advertising purposes to provide a quick link for an app in Appstore to more complicated functions such as proof of presence, proof of service, property key management and asset management. With in-house near field communication (NFC) developers, Authenticate provide full range of product and service to enable your business with clever NFC tags and NFC cards. We also have other NFC solutions such as NFC smart wristbands and NFC bin tags. Whether you want to track swimmers entry to a pool or manage entry to your facilities or track keys, track assets, tools and equipment, you can use NFC tags and NFC cards. We specialize in enabling organizations to achieve efficiency in their work flow by using near field communication technology. If you are not sure what you need or how to use NFC technology, contact us. Below you can find technical information about NFC tags and NFC cards. Chip model: Package low-frequency chip(125KHz): TK4100, EM4200, T5577, Hitag 1, Hitag 2, Hitag S etc. Package high-frequency chip(13.56MHz): FM11RF08, Mifare1 S50, Mifare1 S70, Ultralight, NTAG203, I-CODE2, TI2048, SRI512 etc. Package Ultra-high -frequency chip(860MHz-960MHz): UCODE GEN2, ALIEN H3, IMPINJ M4 etc. easy to use, waterproof, moisture-proof, shock-proof, and high temperature. Application: NFC tags are used for various applications including but not limited to: housing estate entrance guard, bus payment, identity authentication, packing lot management, attendance management, all-purpose card payment, product labeling, etc. Make your business more efficient with NFC tags and NFC cards.